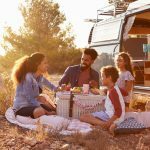 If the thought of your first family foray into the camping kingdom is a little intimidating, try not to be alarmed. It’s not nearly as daunting as it may seem. Embarking on a camping adventure is the ultimate family bonding experience. Camping requires cooperation, teamwork and an exploratory spirit that is a recipe for hearty laughs and happy memories. 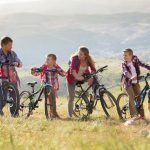 Pluck up a little courage and follow these simple tips to ease yourself and your family into the excitement of the great outdoors. 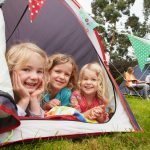 A great way to assess how kids, especially toddlers, will react to sleeping in an unfamiliar environment is to set up a tent in your backyard. Turn it into a game and let them explore the tent zips, pegs, poles and sleeping bags. This will get them used to the idea of camping, all in a controlled setting. Suggest a backyard sleep-out because you know they’ll be open to it. Once you take the plunge, book a campsite on the camping grounds of a caravan park for a soft entry. You definitely don’t want to bite off more than you can chew in a remote location. At a caravan park, you’ll have access to toilet and shower facilities and can learn the ropes in a safe environment with lots of backup. Try to camp in good weather for your first few family trips. Although cyclonic winds or torrential rain can make for an exciting adventure, the last thing you need is for bad weather to literally dampen your ability to have fun or discourage family members from future trips. 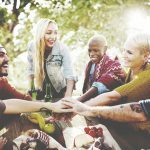 Camp with friends and family and make the experience a group effort. You’ll learn from each other and there will be more eyes on the kids. You can also share cooking and cleaning duties. It’s also a good idea to pitch the tents on the periphery of a central communal area. This provides a safe open space for the kids to play and the adults to relax. Once the kids are tucked in for the night, adults can retreat for a chat, a beer or a glass of wine. Make the entire camping experience exciting for the kids by adding in some fun or adventurous activities. Gaze at stars, play spotlight, or go on a night stroll to spot nocturnal creatures. It’s a fine line between excitement and fear for toddlers, so be careful not to push it too far! Don’t forget to pack the frisbees, balls and a couple of fishing rods for daytime activities. Glow sticks are also entertaining for the kids at night and are a handy way to keep track of their whereabouts in the dark. 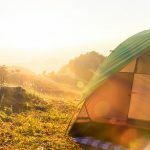 Camping is also an affordable way to escape the hustle and bustle of urban life. In fact, it’s ideally suited to a quick or impromptu weekend break. Not every holiday needs to be an expensive overseas trip staying at resorts or 5 star hotels. Get back to the basics and enjoy quality time with family and friends. Play, interact, cooperate and laugh. You’ll strengthen your relationships, have a blast and your kids will love you for it. Make sure you have the right camping gear at the right price.